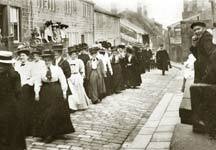 Suffragettes parade through Heptonstall in this rare photo reproduced by kind permission of Mr Geoff Sunderland. The date is unknown but did some of them take part in the demonstration in London which led to the arrest of many supporters? Code no BT907. In January 1907 Calder Valley members of newly-formed branches of the Women's Social and Political Union joined 700 women from all over the country in a march to the House of Commons. "Ugly scenes" developed, it was reported, and mounted police charged the demonstrators resulting in the arrest of 58 Suffragettes who included W.S.P.U. founder Emmeline Pankhurst and her daughters Sylvia and Christabel, and a Halifax woman, Mary Taylor. One of the most prominent Suffragettes in the Upper Calder Valley was Lavina Saltonstall, of Buttress Brink, Hebden Bridge, who organised many fund-raising events in aid of the cause.